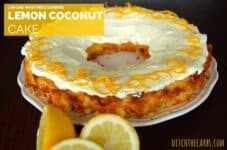 This low carb lemon coconut cake has the best texture of any low carb cake I have made yet. The desiccated coconut ensures it holds together without the slightly ‘odd’ texture sometimes coconut flour gives to a cake. The lemon zest and juice really balance the coconut well. As for the lemon, cream cheese and yogurt icing, divine. When my cake came out the ring tin (which as you know, I love using for cakes to speed up the cooking time and to ensure the outside isn’t dry or the centre isn’t cooked) was a little ‘rustic’ looking to say the least. The icing covered it all up, and made it look beautiful. The icing that was left over, my boys fought over, so it must have been good. Line the tin with baking paper to ensure it lifts out easily. This low carb lemon coconut cake has no added sugar, wheat free and gluten free. Google's favourite low carb lemon coconut cake is best made in a ring tin then the cake cooks evenly and beautifully. You may also pour the mixture into muffin tins too. Mix ground almonds, coconut, baking powder, sweetener and psyllium husk together. Add the melted butter into the centre and mix gently. Add the lemon juice and zest. Mix, then pour into a greased and lined ring tin. Bake at 180C/350F for 25-30 minutes. 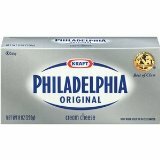 Mix the softened cream cheese with the natural yogurt. Add the sweetener and lemon zest. Mix and carefully ice the cake or serve on the side. My first successful Keto baking!!! Even though I made some mistakes like using coconut flour instead of desiccated coconut. As it absorbed more liquid, I had to spoon it out as it was so thick rather than a batter. I filled 5 muffin cases and one small loaf tin 5″ x 2 1/2″. I’ve not cut the larger cake yet but the muffins were delicious. Not at all dry and a REAL cake texture. I used the cream cheese frosting on the muffins and did a lemon drizzle on the loaf cake which I am taking to share with a friend. Fabulous recipe which I am sure can be adapted with other flavours. Thank You. 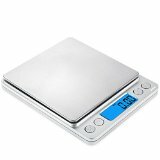 I want to buy a ring pan from Amazon but was surprised to see so much variety. May I ask what size pan you used please? Thank you! Just check the psyllium powder does not have any additives in it. Some psyllium powder is used as a laxative so may have flavours and sugar. The only difference is between psyllium husk and powder, is how finely ground they are. Just made this in a muffin tin, worked great. It made 6 muffins. Guesstimated the amounts as i didn’t have any measuring devices and turned out nice and moist. Didn’t even add the sweetener and it tastes great with the cream cheese frosting! YUM!! Can you make the icing without the yoghurt ?? How about my cream cheese frosting? I absolutely love that one. could I substitute coconut oil instead of butter in this recipe and others also? You may swap coconut oil in place of butter but you will lose that creamy buttery flavour. That’s OK, simply add a little more flavouring (depending on the recipe you are making) and a pinch of salt. With all baking, taste before ranking and experiment with flavours and sweeteners for the perfect result. I recently made this cake as a birthday cake for my husband. It was very good although he thought it was a bit dry. Is there any thing I could do to ensure it is less dry such as adding oil? I’m thinking about making this for Christmas Day. Just wondering how long it lasts for (could I make it Christmas Eve & would it still taste just as good the next day)? I like to make all low-carb baking as fresh;ly as possible, as there is no sugar to help preserve it and we use extra eggs compared to regular wheat baking to help them rise and give structure. I would make this recipe a day ahead, then keep somewhere cool to store until the big day. That would ensure a lovely cake and still be fresh for any leftovers. Merry Christmas. These are absolutely scrumptious!! Made them as cupcakes, replacing the icing with lemon drizzle made with half a lemon’s juice and a tsp of Truvia. Could not tell at all that these are sugar-free! Thank you!! Wondering if mix gently” means with a mixer, or by hand??? Hi Libby. Should I use almond meal or almond flour ? You can use either. I personally use almond meal as it is so much cheaper here. This cake is DEVINE! And I’ve made so many cakes on coconut flour, with that ‘special not quite right texture’. I was looking for something that isn’t all almond flour either. Perfect combination! Well done!!! Hey thanks Michelle. 🙂 What a super review to leave. Are you thinking of the cheesecake perhaps? This one needs to be baked. Made this cake last night to bring to work for my birthday! I was skeptical about it looking at the batter consistency, but it came out beautifully! Everyone enjoyed it and were most surprised it was “sugar free”. I used your chocolate ganache as a more luxurious topping! Hi Libby, can this be made without the psyllium husk? Wanted to try this out for Easter but no one locally seems to carry! Can’t wait to make this! I don’t have the same pan though…. Do you think it would work in a bundt pan? Or I could try a loaf like another person did… ❤thanks! Yea a bundt tin would work. I have made it in a regular tin, I just have found however it works brilliantly in a cake tin without a solid centre (like a ring or bundt tin). It is a heavier cake than most and has trouble baking in the centre without burning around the edges first which is why I use a ring tin (or bundt). Does this have to be made in a ring pan or could you use a regular cake pan? I make it in a ring pan as it is quite dense, so the ring pan ensures it cooks evenly. Any time I have had to cook it in a regular cake tin, it was difficult to get the centre cooked without the outside drying out so I cook it in two smaller cake tins so the cake mixture/batter is not so high and cooks evenly. Ok, thank you! Trying it today and looking forward to it! Hi Libby, could you use limes instead of lemon? I have just been given a heap and need to find something to do with them. Thanks. 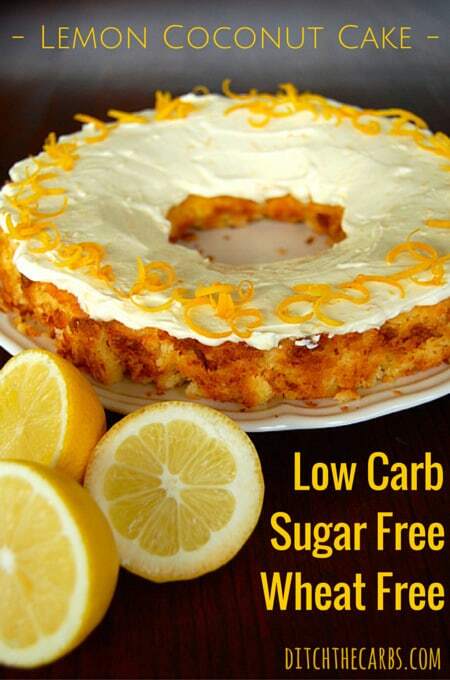 Omg..the best low carb cake by far….. thank you. Yes absolutely. I would cook them for about 15 minutes. YES! Definitely. I did it this week: using my regular-sized muffin tray, it made nine cupcakes and they needed 18 mins in my oven. I had no yoghurt and not much cream cheese so experimented with the icing. I creamed either 50 or 100g of softened butter (can’t remember which!) and 140g softened cream cheese together, then added juice and zest of two lemons, a handful of shredded coconut and 1/4 cup powdered Stevia. Thank you SO much Libby for this recipe – it’s so easy and so versatile – one of my go-to recipes. It always works, only uses what I normally have on hand, doesn’t require any special equipment, and all my wheat-and-sugar eating friends love it too. Thank you, thank you, thank you for this wonderful review. And what lucky friends you have, that you bake for them. WOW!!! After only ever having done low carb baking using Atkins recipes, which use expensive and not so nice ingredients like protein powders instead of flour, I was resigned to the fact that low carb baking meant dry, hard brick cakes and muffins that just aren’t as good as the real thing. I WAS WRONG! I can’t believe how much the look, feel and texture of this cake is just like a regular cake, how moist it is and of course how nice it tastes! I love you Libby! Will definitely be hitting up many more of your baking recipes, thank you! YAY, I love this comment. Atkins is so over processed and has been incredibly detrimental to how low carb is perceived. I like to base all my recipes on low carb whole foods and make them as simple as possible, my tagline is “Real Food, Real Easy”. I’m so glad you like the cake, try my flourless berry sponge and my carrot cake too. With these recipes where net carbs are not listed do we subtract the fibre from the carbohydrates to get the right count? All my recipes are total carbs, so yes, just deduct the fibre for net values. Thank you for sharing the recipe. Do you think it could be baked in the microwave, using something like Libbey Ring Pan Glass Baking Dish (available on Amazon)? Approx. how long would it take in an 1100W microwave? Thanks! I’m thinking it would be able to be cooked in a microwave. I would estimate it would about 5 minutes, although every microwave varies considerably how they cook so check it and add a further minute until the centre is cooked. I’d love you to come back and report how it goes. We loved this! I am not a baker 🙂 and had no idea what I was doing so made it exactly as the recipe said. It was perfect! A beautiful lemon flavour throughout, and the cake itself was deliciously soft and moist. I found a very, very narrow slice (maybe half a serve) more than enough for me, just to get a taste of something sweet after a meal when I’m not actually hungry anymore. There are only two of us in my household so it took a few days to get through and was still delicious days later, though not quite as moist obviously. A keeper for us. Thank you so much. I just made this. Instead of the icing, I made a “sugar syrup” (1part xylitol, 1part water and 2 parts lemon juice) and poured it over the cake as soon as it came out of the oven. It was amazing! Thanks for the recipe! What a superb idea Stella, like a lemon drizzle cake. Wonderful and thanks for sharing your tips. I can’t find desiccated coconut, can I just use unsweetened shredded coconut? What’s the difference? Yes they are pretty much the same thing, different countries call them by different names. Take a look at this page for what I use. 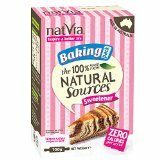 I use a blend of stevia/erythritol which measure spoon for spoon instead of sugar. Take a look at this page to see what I use. Add stevia or sweetener according to your taste and sweet tooth which may be completely different to mine or this who have been sugar free for some time. Ha ha, I often tell my children I rock, they never believe me 😉 Thanks Tanaya. Thank you for the wonderful recipe. I had no yoghurt so I substituted with unsalted butter for the frosting and it was awesome! Would the nutrition in fat, protein and carbs change? Yes, the nutrition given is for a slice with yoghurt icing so by replacing the yoghurt with butter, the fat will increase and carbs and protein will decrease slightly. Damn woman, this is good! I used a loaf pan, because that’s what I had on hand, and it ended up with some leftover icing. What a shame, hehehehe, it had to be eaten right away. Hubby and I tried the cake slightly warm (it wouldn’t fit into the storage box, so we made it fit). Oh so tasty. Thanks for posting! I made this yesterday – it was really simple and a great treat after our meal! Loved the frosting most of all – so creamy! Made it without the psyllium husk. it was really good. Thanks for posting. This cake was really good. Thank you! I used 1tsp stevia powder plus 1tbs Xylitol for the cake part, that was enough sweet for us. I used 1tsp honey to the icing. Yes I am sure it would freeze well. I would cut it into slices and wrap each piece in baking paper then put it in an airtight container. You can defrost 1 slice at a time. Cupcakes would work also. Yes, it looks exactly like a regular cake (see pic). It slices really well and you can even make cupcakes with this mixture too. Hi, I can’t access the site you linked to, the English version of the Swedish low carb healthy fat site. Has it changed its name? Anyone? I’ve just checked the link and it worked. Here it is again. Their site may have been down as mine odes occasionally due to traffic surges. I am trying to make the lemon cake for my friend for my friend for her birthday but can’t eat dairy… what could I substitute the cream cheese with please? And would it matter if I didnt put any form of sweetner in it? It triggers me to want sweet stuff. You don’t even have to ice it if you don’t want, or you could make some icing with coconut cream and lemon zest. That would actually be beautiful. As for sweetener, it is so personal depending on how long you have been sugar free for which is why I always say in my recipes “to taste” because what one person would find too sweet as their taste buds change, another would find not sweet enough. There is no need for sweetener if you can cope without it. Good luck. Could egg be substituted for the psyllium husk? Possibly, I have never tried this. Some people have made it without the psyllium husk and it turned out fine. I just use it to help the cake hold together a bit better. Is ground almonds and almond flour the same thing? Almond flour is a finer texture and generally has the almond skin removed, ground almonds aren’t as fine and will contain the skins. I tend to use ground almonds because it is easier to find and cheaper. I would love to make this for my daughter to take as a treat to school…but they are a nut free school…is there anything I can substitute for the ground almonds? How many servings or your calories and carbs based on ? It states serves 12, but could easily be cut into smaller slices. Hi, thanks for the great recipe idea. do you think this would be okay splitting the cake between two 12.5cm tins? I’m sure that would be fine, just reduce the cooking time. Do you have conversions for regular cake pans? I don’t own a tube pan. If you don’t have a ring tin, any tin or loaf tin will do. It will just take a bit of judgement from you as it is cooking to see when it is ready. Makes sure it springs back when pushed gently with your forefinger or a fork comes out clean with no wet cake mixture on it. Looking for inspiration about what to use instead of butter. My son is intolerant to dairy. I don’t want to use some of the non dairy spreads. Is there a good one that is the best of a bad bunch? Made this tonight and it was fantastic. I evn think I accidentally doubled the baking powder and you’d never know it. Delightful. Hi, if i use Xylitol instead of stevia, is it the same quantity? Sorry I don’t know. I have never used xylitol. I made this with xylitol (Annie’s Natural Sweet) in exactly the same quantities and it was delicious! I have just made this for my family and it is delicious! Thank you for your wonderful recipes. This cake is a massive hit with my family- they absolutely loved it so I must have made it correctly!! My nearly 9yr old son has asked for this cake to be made for his birthday this year…yay! A brand new bday cake recipe!!! Thank you so much!! p.s – love the choc cupcakes too – yummo!! Yay!!! Thanks for the great feedback. I’m so glad you have found a new favourite. Hi There, Can I use Coconut Flour instead of Desiccated Coconut? No. Coconut flour is totally different to desiccated coconut. Coconut flour is the by-product of making coconut cream and milk. It is dehydrated and most of the fat has been removed. I use the psyllium husk, take a look at the image of the brand I use on the page “Food Labels”. I hope you can find something similar. I use psyllium husk. It gives the cake a great texture and makes it hold together really well. What difference would it make to omit the psyllium? Yes I would think so. The psyllium swells and holds the mixture together, similar to gluten in flour. Psyllium gives a lovely texture and adds fibre. Hi Libby, is there anything I can use instead of psyllium husks if I don’t have any? Brilliant. Hope it turned out well. I made this…. Wow…. Such indulgence…thank you for sharing! LCHF is huge in South Africa. Ah thanks so much for the compliment. This has now become my go-to cake and pudding. Last night I just poured thickened coconut cream from the fridge over it. I have heard that LCHF is huge in South Africa. I feel like we are on the verge of it here in New Zealand. I’d love it if you can share my site with fellow LCHF friends. Love the recipe. Going to give it a try this weekend!!! Love the recipe template you are using, is this custom made or a specific plugin? If it’s a plugin, would you kindly share which one it is? Hi there. It’s the Easy Recipe plugin. I’m about to set up a resources page with all the website building tools I use. Thank you so much. Really appreciate your feedback! Argh – looks too too delicious. This is totally to my taste. Lovin the lemon n coconut. Trying to figure out how to convert the grams into cups and keep getting different answers online. Can you help? Great question. I use standard cup which is 240ml (some state it is 237ml), 1/2 cup is 120ml, tablespoon (tbs) is 15ml, teaspoon (tsp) is 5ml. I really must write a conversion page, as temperatures, volumes, weights and even names of vegetables vary around the world. I have now added a new page with Cooking Conversion Charts to show measurements of cups, ml, fl.oz, tbs, tsp, temperatures and even cooking ingredients.